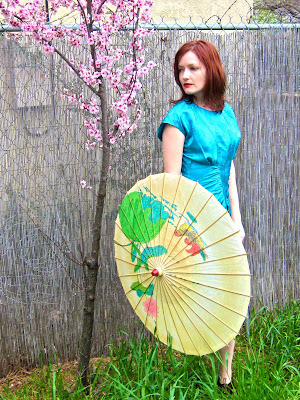 A Shanghai-flavored homage to Spring. Here comes the Cherry Blossom Girl. Vintage Acetate Rose-Embossed Dress in Jade. Nine West Patent Leather/Glen Plaid Spectator Shoes. Yowza, the color of the dress is brilliant. fancy. i love the colours! and the asian inspiration! *ps, I totally do not believe you on your age! !